Are two loops better than one? The X4 proves that two loops equals a lot more fun. In the main easy to use. Superb sound. MIDI sync may take a while to get used to. For its first looper, TC Electronic tried to get away from any superfluous and complicated features that can stifle creative flow, and released the miniature marvel that was the original Ditto - one footswitch, one knob... blimey! And guitarists flocked to it, because it was so simple and fun. Following on from the Ditto's success, we got an X2 stereo version (including dual mono for two players). The X2 took the Ditto's simple operation, but made things even easier with the a second footswitch to stop the loop or to apply an effect. We also got USB loop transfer and the ability to store backing tracks. 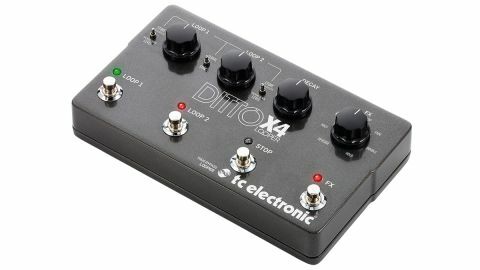 Now, the X4 puts two loopers - each with five minutes of looping time - side by side in the same four-footswitch pedal format as the Flashback X4 delay. "Sound quality is top-notch and operation retains its simplicity." Each loop has its own footswitch but there's also a dedicated 'stop' footswitch that has the dual advantage of stopping a loop with just one tap and also stopping both loops at once dead in their tracks. The fourth footswitch, FX, offers alternative ways to stop loops - you can make a loop to stop at the end of its cycle, or stop it immediately, with either a fade or a tape reel-style slowdown. Other effects available via this footswitch let you reverse a loop, play it back at half- or double-speed with the consequent octave pitch shift, or repeat a short segment of the loop as long as the footswitch is held down. Each loop has a large knob to set its playback volume, while a decay knob determines the amount of volume reduction that occurs each time a loop repeats,ranging from the loop cycle just playing back once to no volume change at all. The loops relate to each other in two selectable ways; Sync mode sees the two loops having the ability to play together at the same time, the second's length being a multiple of the first, while independent loops are kept separate from one another in Serial mode - very useful for separate verse and chorus loops. As with previous Dittos, the sound quality is top-notch and operation retains its simplicity. The only things that might take more than a couple of seconds to figure out are MIDI sync and loop transfer to computer, should you want to use them, and the four set-and-forget switches on the X4's rear panel that let you configure the X4 - how the overdubs work, how the serial loops record and bypass mode - but they are probably in the best default position to start with, anyway. Adding a second loop to the Ditto has greatly increased the creative possibilities both for home use and onstage. You can now build up more complex and intricate musical pieces with ease, plus those effects add a polish to pique an audience's interest.